We failed to make it to either Ashford or Braintree retail outlets on Saturday as the weather was shockingly bad. Instead there was some online research in preparation for a visit today. The research showed the shops at both were similar for home goods and that Ashford was only five miles further away than Braintree in miles, however we both thought the journey there would be less busy, so there's where we headed earlier today. The shops on our hit list were Denby, Christy and Viners (for a browse) and Le Creuset and Pro Cook for a casserole pot and saucepans respectively. Denby was browsed but we didn't need anything from there, nor did anything grab us so it was over to Le C. Earlier this year we'd promised ourselves either a round 22 or 24 casserole dish as a sixth wedding anniversary present to each other. Colour-wise in Le Creuset we're as traditional as they come. Volcanic orange all the way. That's my mum's fault, hers and that it is so iconic. When I was born (in the late-sixties), mum bought a small Le Creuset saucepan and frying pan to cook my dinners in, now I'm the proud owners of these and they're as good as new. Today chose the 24 sized casserole to add to our set, as it was only £8 difference (to the 22) and we expect it to be more versatile. We already have a 20 which is great for two, unless it's lamb shanks you're cooking! Our plan was to retreat outside, compare prices and the pans on offer and take a proper look at the Le Creuset pans again. Back in Le C the pans were good by comparison but the prices were steeper. However as neither MOH and I had bought saucepans since the early-nineties (him Circulon; me Prestige*) we were due a new set and knew we expected our pans to last. 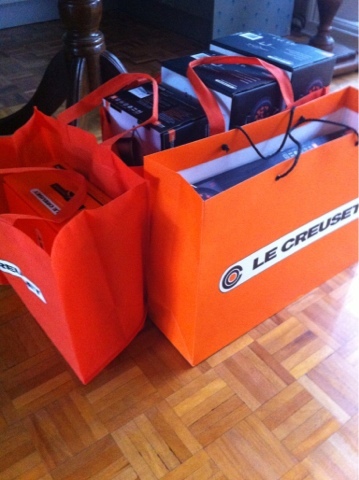 The Le C ones come with a lifetime guarantee and were the nicer pans - black with glass lids, in case you're wondering. So now we're the proud owners of a set of three saucepans and a sauté pan as well as the new casserole dish. An expensive afternoon but buying at the outlet store and Bank Holiday discounts of 30% were very useful and much welcomed. * our early-nineties saucepans are still alive and have been passed to various members of our families!